What was to be a fun night out turned into a nightmare for a group of friends in San Pedro, Ambergris Caye, on Sunday, December 16, 2012, and, a late report from police this evening indicates two female officers reportedly have been interdicted. Amandala spoke to the victims of the incident, who gave their account of what happened a few minutes after midnight that Sunday morning. Ricky Jurado, a 27-year-old San Pedro resident, said he was with some friends socializing at the Tackle Box Bar and Grill when a man grabbed his fiancé, Janina Graniel, 24, around her waist as she was walking by. Jurado said he approached the man to address the issue, and they got into a small argument. The man, later identified as an officer, and his three companions, who were all behaving as if they were intoxicated, walked out of the bar, Jurado said. The said officer and his companions were all later identified as police officers attached to the San Pedro Police department. All were in civilian clothing. Jurado said the group did not go too far, but he smelled trouble and decided to leave as well. “While we were walking past them, [the officer] grabbed me by my neck and pulled out his gun. I guess it was a 9mm, and he just put it in my mouth,” Jurado said. “He threatened me that if I did anything he would shoot me, and that’s when I heard [the female officer] say, ‘shoot that f****** Spanish,’” he went on to relate. Jurado said that he feared for his life and did not resist. He said his fiancé, Janina Graniel, then got involved, and asked why they were doing that to him. Jurado said that was when the female officers attacked Graniel. He said that when he saw what was happening to his fiancé, he tried to move away from the male constable, but the officer put the gun to his head and began to choke him. He said he began to lose his breath and was getting weak, and fell to the ground. Jurado said that that was the first time that the officer identified himself as a police officer. Not knowing the ordeal that was in store for them, Vianie Perez, 29, and her boyfriend, Elder Mauricio, 30, were on their way to the Tackle Box to join their friends, Jurado and Graniel. Upon approaching the establishment, they saw Jurado being held down on the ground by two men. Vianie Perez said they went over to ask what was happening. Perez said that Mauricio was taking pictures of the confrontation with his cell phone, and when the officers became aware of this, they tried to take his phone away. Mauricio tried to give the phone to Perez, but one of the officers forced it from her and then went after Mauricio. “I told him, now why would you go after him when he has nothing to do with it, why are you guys arresting him,” Perez said. “And soon as I said that, a woman [one of the female officers] hit me in the head,” she said. Perez said she saw the person who hit her, and in defense, she began to fight back. She said that at that time, she did not know the woman was a police officer, because she and her companions were in civilian clothing. Perez said that she and the woman began fighting, and they both fell to the ground and began to struggle down there. She said that while the struggle continued, another person began to hit her, but she could not see who it was. The victims said that while the two altercations were happening, two police officers in uniform approached the scene. Jurado told Amandala that he saw when one of the female constables took a baton from one of the officers and began hitting Perez, Mauricio’s girlfriend, with it. “I told the officers [in uniform], are you seeing this, and they said yes. I told them, I hope you say the truth and don’t hide this,” Jurado said. Jurado said that the uniformed officers seemed to have been in shock at what was taking place. He said that the bystanders were also scared, but did not help. He believes that no one rendered aid because the male officer, who had assaulted his girlfriend in the beginning, had a gun. The two newly-arrived officers told Jurado to get into the police vehicle, and he was taken to the police station. “They told me they were going to release me, but that was when the male and female officers in civies, and the other young lady went there. I was just sitting down, but they were laughing at me and saying, ‘You Spanish, you will pay’ and things like that,” said Jurado. Perez told Amandala that one of her cousins asked one of the on-duty officers who saw the incident occur why he didn’t arrest the constable, and the officer replied that he could not arrest the officer. Perez said that after the women had stopped beating her, some people who were standing around and saw the altercation take place had offered to take her to the doctor, but when they went to his office, the doctor was not available, so she was taken to the police station to make a report. Perez said that when they arrived at the police station, she began to make her statement, but was unable to complete it because the officer told her she had to make a medical report first. 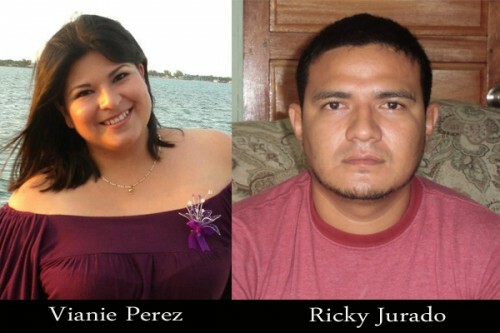 Perez said that she and Mauricio went back to the police station on Monday, December 17, 2012, to continue making their report, and upon arrival at the station, they were detained and informed that they were being charged. Incredibly, Perez was charged with assaulting an officer, wounding an officer, and obstruction. Perez said she does not understand why she is being charged with wounding when she did not see anything on the female officer’s body that would justify that charge. Mauricio was charged with verbal assault and obstruction, while Jurado was charged with obstruction. It wasn’t until the couple was detained that they found out that Jurado had spent the night in jail. Perez said that she and Mauricio were in custody for about five hours before they made bail. Jurado also made bail on that same day. Jurado said that the male officer apologized for “offending him,” but did not drop his charges against him. “He said he doesn’t even care, because all they could do to him is transfer him to Belize City,” Perez said. Perez, Jurado and Graniel are pressing charges against the officers. Perez and Graniel both had physical injuries. Perez, whose injuries were classified by a doctor as wounding, sustained injuries to her head, forehead, face, and eye; Graniel has multiple cuts and bruises on her hand, arms, legs, and thighs. The victims said that this incident has only stirred up fear within them. “Every time I hear like a car in front of my house, I think it’s the police coming or something,” said Jurado. Perez said she is willing to take the matter to whatever level she has to in order to get justice. She said that her court date is set for February 14, 2013. Amandala went to the San Pedro Police Station on Wednesday, December 19, 2012, to try to get the police side of the incident, but somehow, no one wanted to speak on record about the incident.